The video advertising industry will see four key changes in OTT, traditional TV, online video, data activation, and transparency, according to a new report released this week. The '2019 Video Advertising Trends' report from adtech firm SpotX , is based on a combination of third-party data as well as what SpotX hears from media buyers, sellers, and other industry players in-market. “This report made it very clear that both media buyers and sellers must be flexible and ready for change, whether it be diversifying their ad spend or seeking out new global opportunities to increase the value of their inventory,” said Mike Shehan, co-founder and CEO at SpotX. “Data privacy is still a major concern for key stakeholders and the entire industry will need to comply with new regulations. Still, there are so many exciting opportunities this year as technology continues to improve, and we should all feel very hopeful about what’s coming our way — from advancements in addressable TV to data enablement in OTT. We can expect to see better advertising experiences for consumers as targeting continues to improve for advertisers. We’ll see more initiatives to increase industry transparency and supply path optimisation. 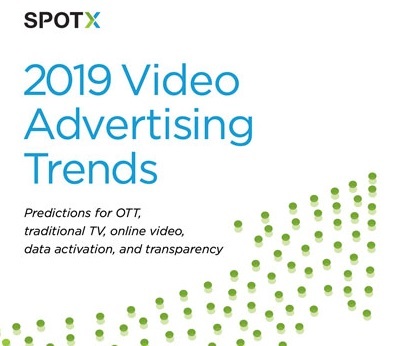 The full report is available to download at: https://www.spotx.tv/resource/2019-video-advertising-trends/.